Missing the provider you need? By using OAuth.io, you are free to focus your attention on product development instead of losing time on API integration using OAuth. OAuth.io works with all your favorite platforms, whether social (Facebook, Twitter, LinkedIn…) or SaaS (Mailchimp, Paypal, Stripe…). With OAuth.io, you can make API calls instead of dealing with complex OAuth flows. Abstract tokens with the ‘Request API’ and get user info in a unified way, no matter which provider you are using. The API also lets you perform CRUD actions on behalf of users. OAuth.io lets you choose an authorization flow that fits your needs (client-side or server-side). It secures providers API access with SSL encryption and allows you to specify domains/url restrictions for more security. 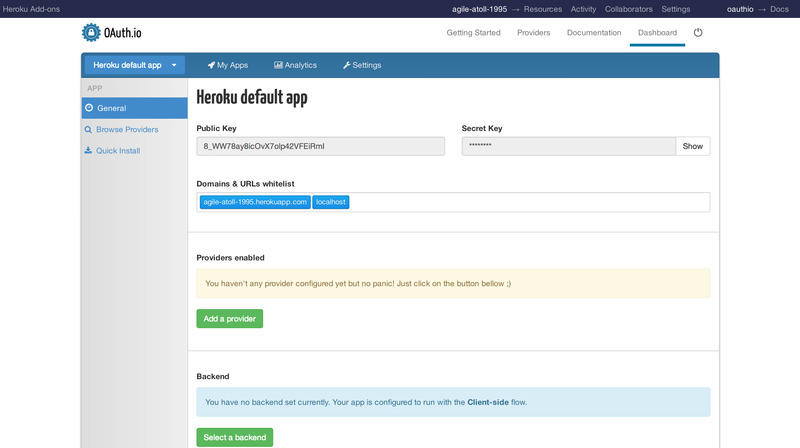 Through the OAuth.io add-on, you can start adding OAuth providers to your Heroku app. You’ll then get a public key to start using these APIs right away. You can add OAuth.io to your app either through the add-on catalog or through the CLI. You can get the full list of plans in the Heroku add-on catalog. or by visiting the Heroku Dashboard and selecting the application in question. Select oauthio from the Add-ons menu. To add a provider, click on the button and search for the one you want for your application. Then follow the instructions. If that’s not already done, you’ll need to access the provider’s website, create a developer account and create an app there. You’ll usually need to specify a callback URL on the provider’s website, which must point to https://oauth.io/auth and the domain that must point to oauth.io. We already add by default your app’s domain. You then need to get the API key and the API secret. Once you have them, go back to oauth.io and fill the form. Feel free to repeat these steps for every provider you want to add to your app. You can then try your API keys right away on OAuth.io by clicking on Try auth and debugging the response as needed. If everything is working by now, you are pretty close to success! The OAuth.io add-on adds the following config var to your Heroku app: OAUTHIO_PUBLIC_KEY. Use the heroku config command to view your app’s config vars. OAuth.io lets you choose an authorization flow that fits your needs (client-side or server-side). You can use OAuth.io either server-less or with the server-side flow if you don’t want to use APIs directly from the front-end, but rather through web-services inside your backend. Either you choose the server-side flow or the client-side flow, you will need to use one of our SDKs. Check out our Security Topics to help you make your choice. In the <head> of your HTML file, add a script link to the SDK. The exact details of how you access the OAUTHIO_PUBLIC_KEY environment variable will differ depending on your language and page rendering framework. The popup method launches a popup over the app that asks the user to log in to Facebook and accept the permissions you set in your OAuth.io app. Once he accepts them, the popup disappears, and the callback given in the .done() method is called with a result object as first argument. The result object is what contains the access token. It also lets you perform API requests easily, as we will see in the next step. Note that here, we pass the result to a callback that is going to be called in the next step. You can manually make requests to the provider’s API with the access token you got from the popup/callback methods, or you can use the request methods stored in the result object. //with the field "name" containing the name "John Doe"
Note that the result objects also contain the .get, .post, .put, .del and .patch methods that allow you to perform standard HTTP calls to the provider’s API endpoints. For more information and examples, check our API Reference. The me() request is an OAuth.io feature that allows you to retrieve a unified object describing the authenticated user. This method can be used for many providers, and will always return the same field names when they are available. That can be very useful when you need to login a user via several providers, but don’t want to handle a different response each time. The response object also contains a raw field, which contains the provider’s original response. The OAuth.io add-on can be removed either through the add-on catalog or via the CLI command heroku command. Check out our wishlist if you want to use a provider that is not in our list! Check out our security topic, which will help you understand the oauth.io client-side flow and security concerns related to OAuth and our implementations. All OAuthio support and runtime issues should be submitted via one of the Heroku Support channels. Any non-support related issue or product feedback is welcome at OAuth.io.